The Horizon Adventure 5 tends to be priced at $1,099. Want more workout apps - There are 35 workout programs on the Adventure 5, which is more than other competitor treadmills. Need space - The 20” by 60” running area is great for runners of all sizes. Walk or jog friendly - The 2.5 CHP motor is up for daily use, though may not be strong enough for frequent runners. Slightly better in some categories - The Adventure 5 has a slightly larger display, and a few more programs than competitor treadmills. Smaller motor - The Adventure 5 only has a 2.5 CHP motor, while the NordicTrack C990 and SOLE F63 have 3.5 CHP motors. Warranty is only okay quality - While it is expected to have a lifetime warranty, the short parts warranty (3 years) and labor (1-year) may leave users holding hefty repair bill. Overall, the Adventure 5 is an average treadmill without many stand out qualities. Footprint In Use (W, L, H): 34" x 76" x 54"
Footprint Folded (W, L, H): 34" x 50" x 64"
Motor Size - The motor in this treadmill is 2.5 CHP. Not the strongest motor in its price range as both the C990 and F63 have 3.0 CHP drive motors. Motors under 3.0 CHP are better suited to walkers and joggers as they might burn out faster under more demanding users. However, the Adventure 5 motor should be up to daily use. Running Area - The running surface is 20” x 60”, which is industry standard for this treadmill price point. Our testers have found that treadmill which are 60” in length fit all different heights, from our 5’1” testers up to our 6’5” testers. So if height is a factor in your treadmill purchase, be sure to look for one at least 60” in length. Weight Capacity - The Adventure 5 can hold a user who weighs up to 325 lbs. This is higher than the C990 (can hold 300 lbs) and equal to the F63 which can hold 325 lbs. As the treadmill itself only weighs 188 lbs, we are not sure the Adventure 5 can really hold 325 lbs. Our heaviest tester is 220 lbs, and he found the Adventure 5 to be very bouncy and slightly unstable when he moved faster than a walk. So while the Adventure 5 can technically support a user up to 325 lbs, we would caution users over 250 lbs to be careful as they use the faster speed settings on this treadmill. Folding - When in the folded position, the Adventure 5 is 34" wide, 50" long, and 64" high. The deck is light and easy to lift, thanks in part to the hydraulic system built into the Adventure 5. Space / Footprint - The Adventure 5 when in use is 34" wide, 76" long, and 54" high. It is a fairly compact treadmill and would fit well into small apartments where space is an issue. At 188 lbs, it is not exactly light, but can be moved easily by one person when utilizing the tilt-and-roll wheels on the front of the treadmill. Max Speed - The treadmills max speed is 12 MPH. Once our testers reached running speeds, the Adventure 5 became fairly bouncy. So while it can reach 12 MPH, we don’t recommend users utilize the top speeds often. Also, the interface for the Adventure 5 can be frustrating for new users as it is a two step process. The speed and incline selections are the same row of buttons, so if for example you want to increase your speed to 5 MPH, you need to press the 5 and then press the button labeled “select speed”, located on the far right of the number row. It can be tricky to get used to and potentially dangerous if you are struggling to maintain your pace and need to slow down quickly. 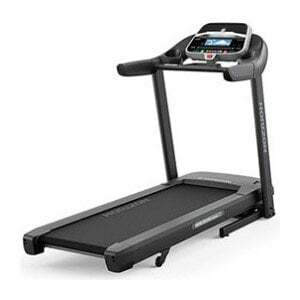 Incline - This treadmill has an incline range of 0% - 12%. The Adventure 5 feels more stable to use when on an incline, which may be due to the fact that people go slower on inclines. Also, while the C990 has the same range, the F63 can reach a 15% incline. Display - The Adventure 5 has a blue, 7.5” LCD. The display has a strong backlight and shows workout stats like calories burned, heart rate, speed, pace, and distance elapsed. It is a larger display than the C900 and F63, but is not a touchscreen like the C990. Speakers - The speakers on the Adventure 5 are okay quality. While the treadmill sounds won’t drown out the highest volume of the speakers, the sound quality deteriorates enormously as you go beyond the middle volume levels. Fans - There are no fans on the Adventure 5. Heart Rate Monitoring - There are EKG handlebar grips on the Adventure 5 treadmill so you can monitor your heart rate. These are not very accurate, which is common among all treadmills. There is no heart rate chest strap with this treadmill. ViaFit Connect - By using the ViaFit Connect app, you can have your workout information sent to the app, allowing you track your workouts. This information can also be synced with other fitness apps, like MyFitnessPal. Passport - If you purchase Horizon Passport player (sold separately from treadmill), you can link your treadmill to your TV and virtually run in destinations across the world. Energy saver - After 15 minutes of inactivity, the Adventure 5 will go into power saver mode. Warranties - Lifetime frame and motor, 3 years parts and cushioning, 1-year labor. Customer Support - The customer support number hours are Monday-Thursday 7:00 a.m. - 7:00 p.m. CST, Friday 7:00 a.m. - 5:00 p.m. CST, with no hours on the weekends. The email support hours are unlisted, but you can contact Horizon through email. As mentioned earlier, the Adventure 5 is not the most stable treadmill. While users should be sure to make sure any treadmill is placed on a flat stable surface, it doesn’t seem to make a difference with the Adventure 5. Another potential build issue is the molded plastic side rails. The rails do not feel very thick and may not be up to dealing with much stress. As this treadmill is rated for up to 325 lbs, molded plastic side rails seems like a poor choice. The 3-zone Variable Cushioning mimics pavement running more than other treadmills. While treadmill running is supposed to be easier on the joints than pavement and asphalt, if you prefer a more cushioned experience, you may want to look at another treadmill. While the Adventure 5 is a decent quality treadmill, there are better treadmills for the same price point. It has a small, 2.5 CHP motor with an unique interface which is not necessarily a positive thing. The display of the Adventure 5 is a bit larger than the other treadmills in its price range. However, it is not a touchscreen which lowers its utility. With no fans and only decent quality speakers, the entertainment value of this treadmill is low. For the price, there are better treadmills than the Adventure 5. We recommend that consumers buy directly from the manufacturer website. This will save you money and ensure you receive the latest models. You can also be sure to get the best price buy purchasing through the manufacturer.